The stuff that dreams are made of is going up for auction at Bonhams New York on November 25th. It’s the black bird from The Maltese Falcon, the MacGuffin that drives the plot of the classic 1941 film noir starring Humphrey Bogart as hard-boiled private detective Sam Spade. 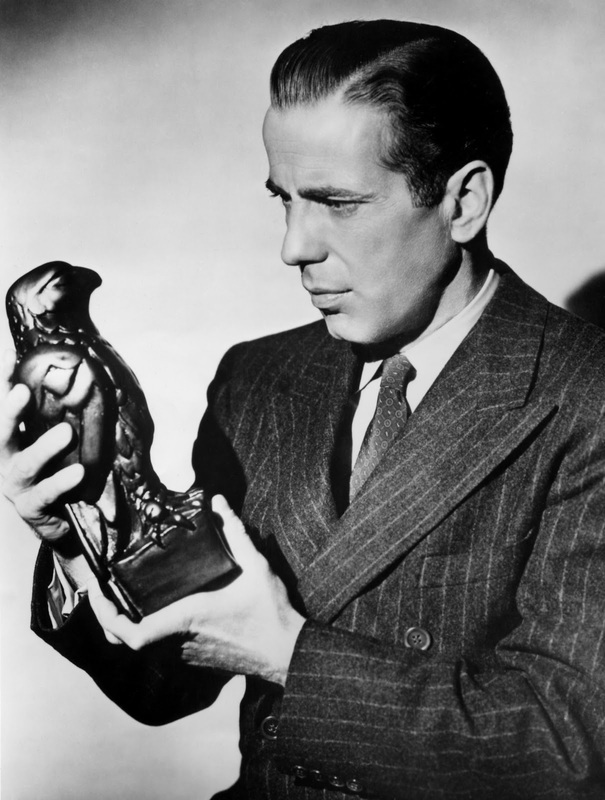 In Dashiell Hammett’s story, the Maltese Falcon is a golden statue encrusted with gemstones that was made in the 1530s by the Knights of Rhodes as a gift for Holy Roman Emperor Charles V to thank him for giving them the island of Malta. The falcon was lost on the way. It traded hands many times over the centuries, getting a coating of dull black enamel at some point to disguise its obvious value. Hammett was apparently inspired by the Kniphausen Hawk, a ceremonial pouring vessel made in the late 17th century for Count George William von Kniphausen. It stands on a rock base and is encrusted with garnets, amethysts, citrine quartzes, emeralds, turquoises and sapphires. It was bought by the Duke of Devonshire in 1819 and has been part of the Chatsworth collection ever since. The movie prop version looks nothing like the Kniphausen Hawk. First-time director John Huston hired his old high school friend Fred Sexton, a prominent Los Angeles artist with paintings in the collections of stars like Edward G. Robinson and Paulette Goddard, to make the falcon for the movie. Several falcon props were made after Humphrey Bogart dropped the original prop on his foot leaving it with a dented tail. Three copies are known to exist today, two made out of lead weighing 47 pounds, and one six-pound resin version that was used in scenes when the bird is being carried. The original with the busted tail is in the Warner Brothers Museum which can only be visited if you pay $52 for the VIP studio tour (EDIT: No it’s not. The auction falcon is the one that was dropped. See update here.) The resin falcon was lost for years before being rediscovered in 1991. It sold at auction in 2010 to a consortium including actor Leonardo DiCaprio for $305,000. One of the lead birds was given to actor William Conrad by studio head Jack Warner. It was sold at auction in 1994 after Conrad’s death. 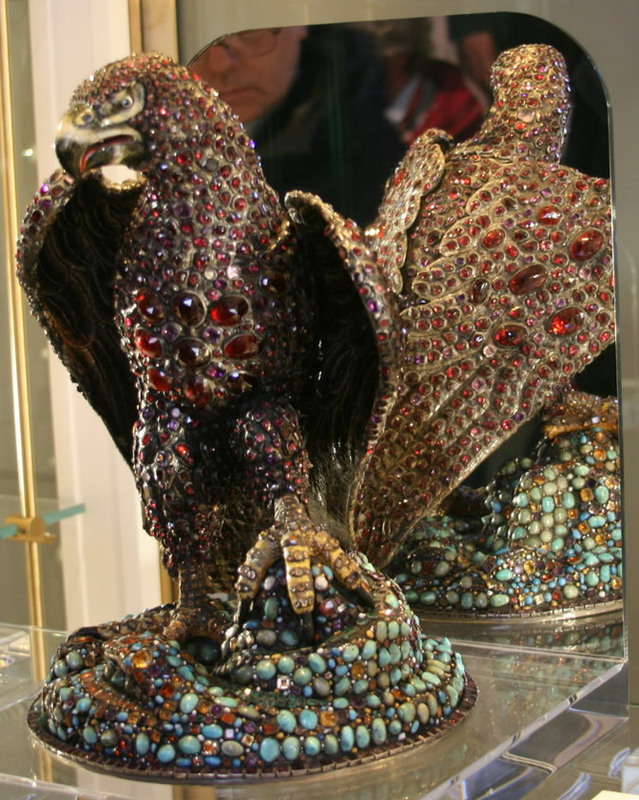 Jeweler Ronald Winston, son of Harry Winston, bought it for $398,500 (a record price for a movie prop at that time) and used it as the model to make the bird all the crooks in the story dream of. The Winston falcon is made out of 10 pounds of gold, has cabochon Burmese ruby eyes and two sets of interchangeable claws, one gold, one coral. From its beak hangs a platinum chain with a 42-carat diamond. It took two years to make and cost $8 million. It was displayed at the 69th Academy Awards in 1997. The falcon coming up for sale in November is the other lead piece. It has been owned for decades by a private collector who has loaned it to museums for public display. There is no official pre-sale estimate yet, but it’s likely to fall in the millions of dollars, which means the black lead bird will be worth almost as much as the solid gold one with the ruby eyes and giant diamond in its beak just because it was in a really great movie once. This entry was posted on Thursday, August 8th, 2013 at 11:56 PM	and is filed under Modern(ish). You can follow any responses to this entry through the RSS 2.0 feed. You can skip to the end and leave a response. Pinging is currently not allowed. I hope Adam Savage from Mythbusters knows about this, he’s obsessed with the Maltese Falcon – he makes replicas for a hobby! I read about that! If he has a few million dollars to spare, now’s his chance. Yippie, I know a relative of George William, but had never heard about that ‘falcon’. What is so ‘Maltese’ about it ? Did the Knights really give some kind of birdy to the emperor ? If so, did George William know about it ? 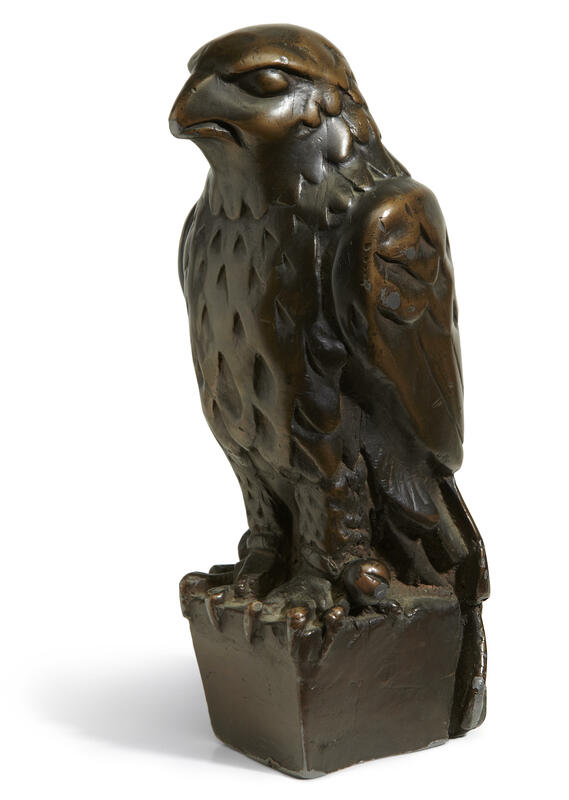 The Maltese Falcon is a fictional statuette invented by author Dashiell Hammett. It does not actually exist. The bit about the emperor is just part of the backstory. The Knights of St John had been kicked out of Rhodes in 1521 by Sultan Suleiman the Magnificent. After kicking around a few years, they were in 1532 offered real estate in Malta and Tripoli, both holdings of Charles V. (It was a cheap way for him to deal with Barbary Corsairs, among other things.) The rent was a single Maltese falcon every year, and a mass for his soul. The gold thing is pure Hammett embellishment. The Knights lost Tripoli in 1551, but stayed on in Malta until 1798, when Napoleon picked it up on his way to Egypt. They still exist, by the way, but are now more involved in medical good works than in fighting infidels. Here’s Adam Savage discussing dodo’s and his work on his own Maltese Falcon. Well worth your fifteen minutes. s much too big to be the hand prop used in teh movie, so I’m guessing if it’s not a gaff for the tourists, it was the bird used in the opening titles. Hi – this has been an eye-opener for me – I am the daughter of Mary Astor – and you afficionados of the Black Bird know who SHE is! Yeah – I wouldn’t mind getting a chunk of royalty from the transaction – I think Mom and Bogie and the rest of the long deceased cast would be stunned that their controverial prop was being sold for said amount!!!!!! It was a great picture – did you know that it was used at UCLA as a subject for a whole filmmaker’s course? Those actors and director were household names to Mom and me – I had a horrific crush on Bogie – I was 9 years old! Enjoy the bird – you guys, real or fictional – it makes for good conversation – STILL. Oh wow, what a pleasure and honor to hear first-hand about the luminaries that graced one of the greatest pictures ever made from the daughter of one of said luminaries! Clearly you had excellent taste even as a nine-year-old. It took me years to appreciate the immense appeal of Humphrey Bogart. Perhaps if he’d been my mother’s fictional plaything, I’d have come to that understanding earlier. What do you think your mother would say about the Black Bird selling for more than $4 million dollars? It’s like the movie made itself come true! Thanks for your thoughts – I like what you said about Bogie – he’s neither fish nor fowl to some people – but he had a lot of warmth and charisma. My being on the set for some of the scenes was exciting – but what does a 9yr old really know? I had so much ‘glamorness’ around me, it was too much for anyone, really. So in my senior years, I’ve done my best to live simply and without the frills. I tell fans the stuff I know, and if that makes them happy, I’m glad for that. It’s amazing how much Mom’s fans come out of the scenery and still want to know about her. To answer your question – seeing how Mom’s life was at the end – alcohol and financial ruin and illness, I’d think she’d think it – well are there words for it? It is so mind-blowing to me – that something is ‘worshipped’ almost so much and is so valuable to so many – I surely can think of many much better uses for 4M bux. Well, dear fan – Ill leave you with the URL to Mom’s picture gallery if you haven’t already viewed it. I am writing a spec piece on your mother and the 1936 custdy trial and am wondering if you might be able to answer a few questions. I know it was something that she didn’t llike to discuss publically but she did write quite candidly about it in in “My Story” and covered it again “A Life On Film” and I am hoping that she might have discussed the subject with you.